Bullying is nothing new - it has certainly been going on for as long as I can remember. My first experience of this type of behaviour was back in the ‘olden days’ when, as a 10 year old, I became what is known as an ‘immigrant’. My family (Mum, Dad, three sisters, brother, and I) had farewelled all of our family, friends and neighbours in Ireland and England, and set sail for our new life in Australia, where Dad was to take up a teaching post as Head of English Department in a country high school. Migrants were still rather a novelty in country NSW in those days, and certain students in my new school saw my minority status as an open invitation to tease, ridicule, and humiliate the ‘new kid on the block’. They repeatedly mimicked my accent, made fun of my English clothing and whatever Mum had put in my lunchbox for the day. I began to hate going to school. It was a very lonely, distressing, and unhappy time (until they got to know me and we became friends) and to this day, I still cringe, whenever I recall the time that the nun on duty at playtime, rang the bell to command the other children to include me in their games! 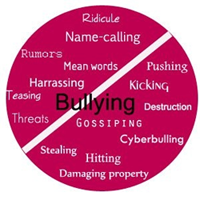 Bullying then, is nothing new, however, what IS new is the frequency with which we are hearing about this behaviour, and the alarming rate at which it appears to be escalating, in our schools and wider society. Bullying occurs in many different forms - from verbal, emotional, and racist bullying, to psychological, physical, and the now, all-too-prevalent, modern day phenomenon, cyber bullying – but one thing is for certain, whatever form it takes, it is NEVER OK! There is great wisdom in this, and education is KEY. Providing children with coping strategies for dealing with distressing behaviours, if and when they arise. Looking back with adult eyes, I’m sure the behaviour of that handful of students from my school stemmed more from a lack of understanding than from any conscious malice on their part. This belief prompted me to tackle the issue of bullying head-on, in a way that would make it easy for children to understand - the non-threatening medium of song. Drawing on my childhood and teaching experiences, I set about writing lyrics to address various types of bullying behaviours, including the ever-increasing cyber bullying - with an emphasis on the right of every child to feel safe and protected. 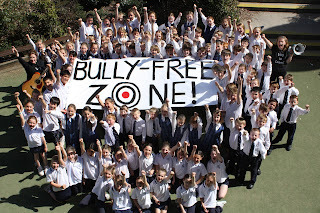 My colleague, Kathryn (Radloff) worked her usual magic with the music, and the result is 'BULLY-FREE ZONE!' - a whole school positive behaviours approach to addressing unacceptable behaviours in primary schools. Deal with problems as they rise with conflict resolution. Everyone is welcome here, but bullying we reject! ©Lyrics, Nuala O’Hanlon/Music, Kathryn Radloff. All rights reserved. 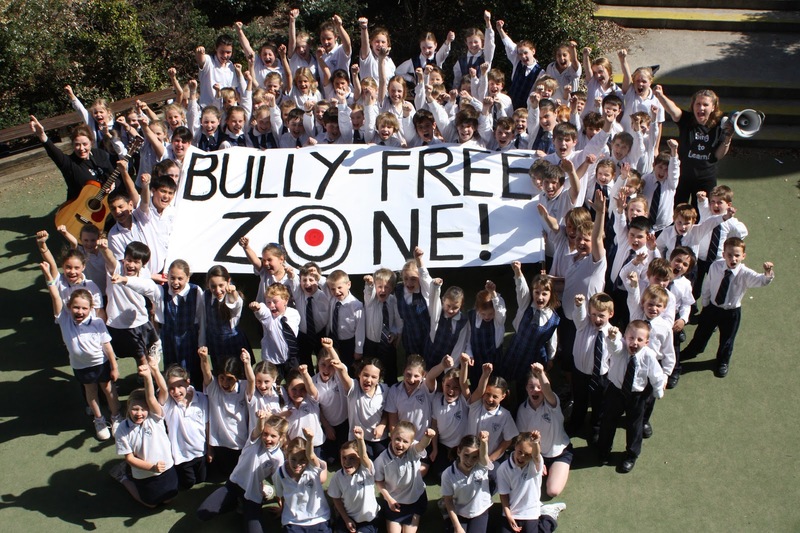 as far as writing to a local newspaper to urge other schools to become bully-free zones! This is the video we recorded on the day – I hope you enjoy it! Nuala O'Hanlon. Watermark theme. Powered by Blogger.